Create an animated GIF in minutes from any online video. There are almost as many ways to create animated GIFs as there are cat gifs. For this bit of claim staking we are going to use an easy to the use, free tool from Giphy that let's you create one from a segment any YouTube or vimeo video. It's not required, but if you think you might create more than just one, start by creating an account on giphy. This will make it easy to find ones you have made, and it creates a nifty portfolio. 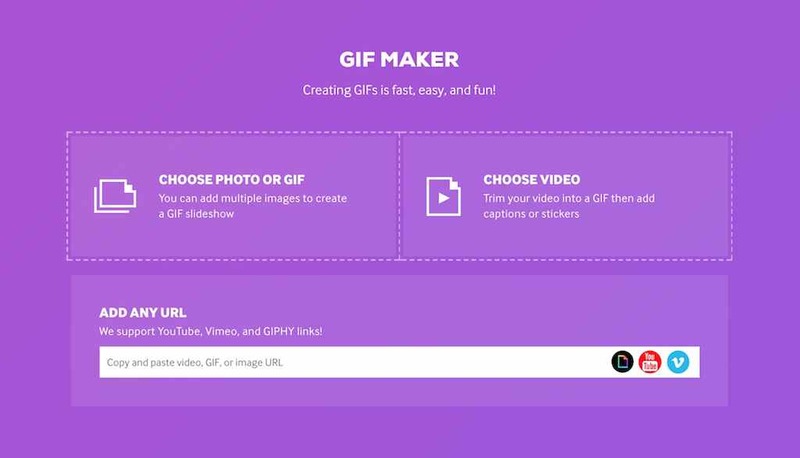 The Giphy GIF maker allows you several ways to create your short form animated gifs. We are going to start with the bottom option, entering the URL for a YouTube or vimeo source video. Note for later exploration you can upload a series of images (top left) or your own video (top right) to also create GIFs. With the Add Any URL tool you are able to select up to ten seconds of any video clip to generate as a GIF (3 seconds is a better length to aim for to keep the file size smaller). 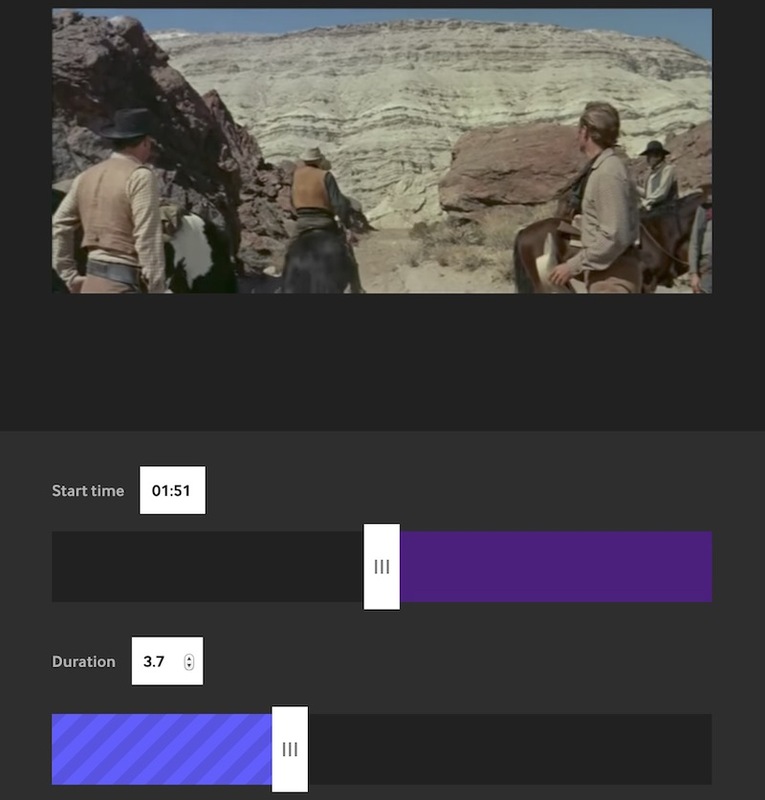 For this first practice, it is interesting to see how people select different portions of the same video, so we are going to use a clip of a scene from The Big Country (the same movie we have used throughout the site). Are you ready to GIF? (nod your heads "yes"). 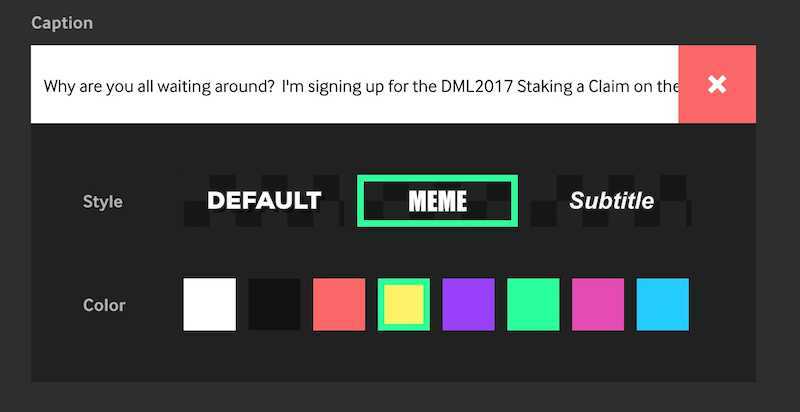 Okay head over to the Giphy GIFmaker tool. In the bottom field of GIF Maker paste in the URL https://www.youtube.com/watch?v=9SDYkONnfCw. This brings up a (silent) view of the video and the controls to select the portion of the video to make into a GIF. Use the top slider to select the start time of the GIF and the bottom one to pick it's length. The preview will show you the loop for just this selection. Aim for the shortest length possible but also that makes use of the looping point to emphasize something important in the clip. But wait, you are not done yet! you can also add a caption to your GIF, give it dialogue. You can choose from three styles and a few colors. Note that on the preview, you can also move or resize the caption. And that is all there is to making a GIF from a video. Click Create GIF and wait a few moments. We used this clip to generate a GIF about signing up for the workshop; the part where the leather vested cowboy took off riding a way worked perfectly (well we think so). Once your GIF has been created, you will see it has it's own URL and a set of options for downloading or sharing in social media. Once saved to your computer, you can use it like an image in almost any web tool, document editor. Now that you have created a silly western GIF, try to think of a video you can use from your own subject/interest area that might be interesting to extract a small segment as a looping animated GIF.